Special designed for Dragon Boat Festival(Duanwu Festival). Best to send to parents or senior relatives. 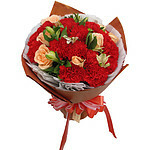 15 red carnations and 5 roses bouquet with stylish greens.